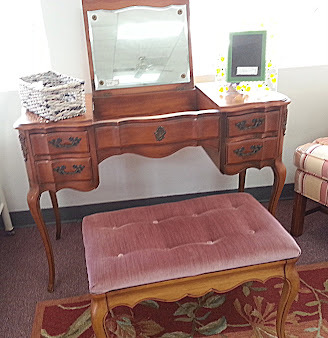 Some of you I know are drop dead gorgeous all of the time, but if you are like me, maybe you can relate to Camille, my vanity, who needed a little help, but in the end, turned out beautiful. Here’s the photo I took of Camille, with my phone, when I first found her at the thrift store around the corner from our new house. I’ve been looking for a new vanity for the new house, and just wasn’t finding what I was looking for, then I saw… her. I took a picture, so I could think about if she was, you know, the one. I knew pretty legs like Camille’s, don’t come along every day, but I also knew we weren’t ready to move yet, and my house was (is) beginning to look like a junk shop. I used my homemade chalky paint for Camille. 3 T Calcium Carbonate/cup of paint. For the bench, I used a French ticking gray linen fabric with blue stripes. BTW, you don’t need to use 100 staples when upholstering a small piece like this. I think I removed at least that many, and in the end, just left some, because it was becoming so tedious to remove all of the old staples. The worst part was that they were brittle and broke when I pried them up with my screwdriver. Each piece had to be extracted with pliers. The old bench was tufted, so I had a decision to make. Was I going to tuft the new cover or not? I decided not, I just wasn’t “feeling it.” That meant I needed new foam for the seat, since the old foam, had little holes where the buttons were. I hope you are reading this and not just skimming, because here’s an important note: The above photo shows What Not to Do!!. I added a new piece of foam then wrapped it in batting, stapling the batting in place. I had too much bulk on the botton of the seat and it wouldn’t sit flat on the base. I had to cut away a lot of the batting on the bottom. Here is the bottom after I cut away much of the batting. Then I started over. Sorry not so pretty, but you need to know. Remember I removed a gazillion staples, and I was ready to be done with this bench, so it isn’t so neat looking here on the bottom. I left quite a few staples since I was tired of pulling them out. As I stretched the fabric over the foam, I made sure the stripes were straight and that the pattern was centered. I started with a staple on the north side, one on the south side, one on the east side, then one on the west side. I tightened and straightened as I moved toward the corners, doing them last. I don’t strive for perfection, but a finished product that looks good. I have too much to do, so I can’t spend a week on this project. 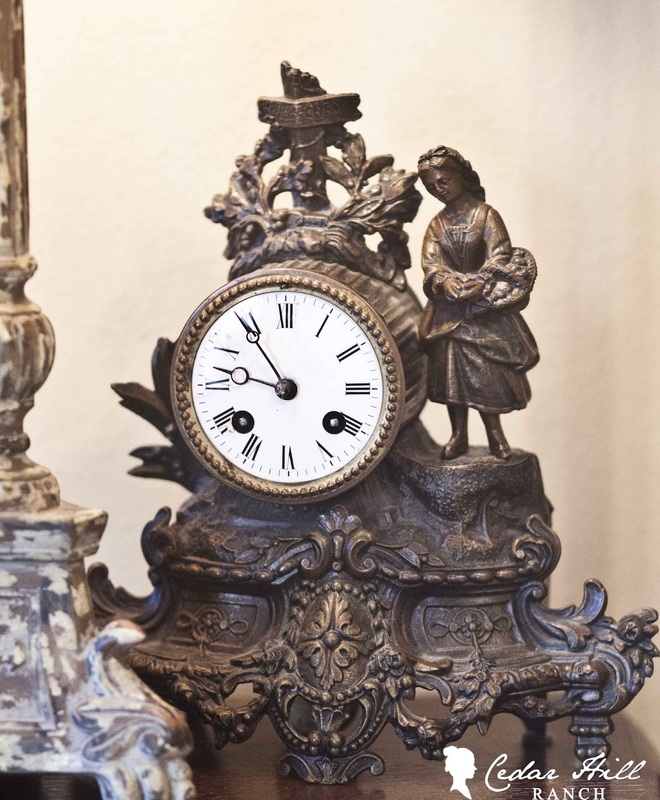 Did you notice I put one of my favorite things, this French clock on my new desk? I also used a lamp from Mr. CH’s grandparents. 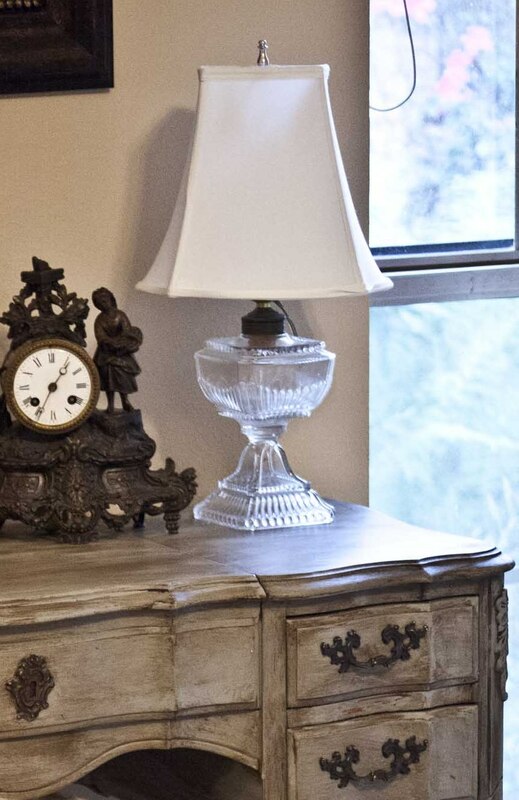 It’s 100 years old, and when they first bought it, it was a kerosene lamp. Only much later, did they covert it to an electric lamp. I think Camille will be very happy with her new look. She’s a looker and a keeper! So pretty! Beautiful transformation Anita! LOVE the color LOVE that fabric.Oh I wish I had jumped on that fabric when decor steals had that.Hope they do that one again! Beautiful piece Anita! It turned out great!! She’s beautiful, Anita!! You did a terrific job to give her a whole new look. What a beauty!!! Your vision is incredible…great color choice and love the fabric on the bench, a beautiful duo! Positively love your new vanity/desk! 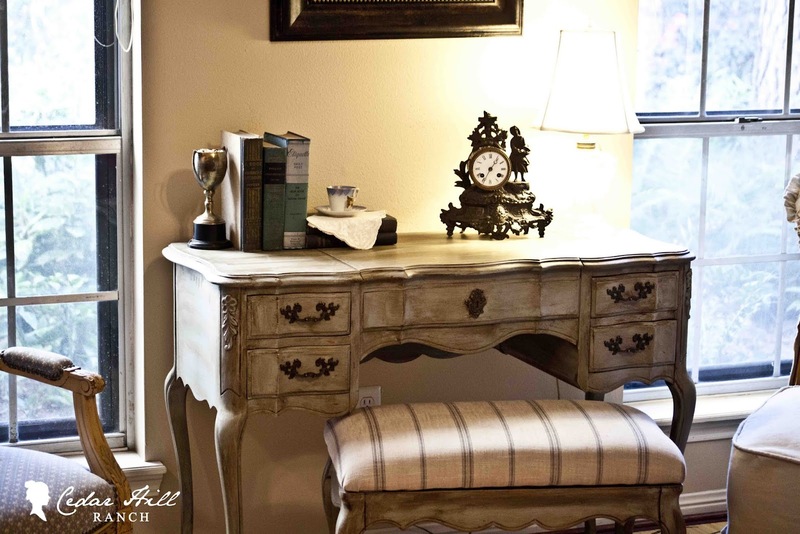 The color palette you chose is perfect and the French clock and desk look like a marriage made in heaven. That perfect piece is sometimes work the wait. Just beautiful, Anita! What a great find. Love the new color, too. Camille is gorgeous…I have a vanity in the attic just waiting for a “new dress”….you did a gorgeous job…Now, do you prefer the Fiddes Rugger Brown Wax over the Annie Sloan Dark Wax?….love the fabric on the bench and great tips…thanks…and have a great day! Wow! You did an awesome job and Camille has got beautiful legs!! I use Fiddes antique brown mixed with clear for light colored paints, antique brown on medium toned paints, and the rugger brown on dark toned paints. The Annie Sloan dark wax seems too dark for most colors. I think you need a very rich deep color to use that wax. Camille is simply beautiful. So glad that you purchased her as she looks great. I know you will enjoy her for many many years. Camille, Camille, Camille…. you make my heart go pitter-patter. I’m so glad I got to meet Camille. She’s stunning! Oh, how I wish I could muster the courage and the patience to do something like this to my vanity!!! My timidity is borne of the fear of complete and utter failure. That vanity is of such great sentimental value to me, and I would hate to destroy it because I’m not very good at these kinds of projects. I LOVE the look, though. So now I’m all hopped up and wanting to do it! 🙂 I will definitely take your advice re: the seat batting stuff since I intend to re-cover the seat, too. That’s something I might not have considered and would end up doing much more work than necessary. GREAT tip! I also like the way you have her all dressed with the trophy cup and clock. Very pretty! This is a beautiful makeover…LOVE that fabric!!! OOOhhh la la!! Camille is a stunner . Such a wonderful transformation Anita. I too just redid the seat of my vanity’s bench and was telling the Mr about the 101 staples that were in it all old and rusted and I too had to remove the majority with pliers. What a chore!! This piece is just gorgeous. I love the lines and the color and the fabric on the bench is gorgeous. Job well done. I love the transformation! You did such a great job…with both the painting and the reupholstering. A talended gal you are! Thanks for sharing the how-to! Camille is loverly. I name my furniture, too. 🙂 I love your paint treatment on her! It is so sweet that you named your furniture. I love how you made Camille over, she looks lovely. Camille is a beauty Anita and I love the bench makeover too!! I think I had this very vanity growing up…wonder where in this world it is? she is beautiful! Well done! After reading ALL of your staple removal woes…I’m not sure I’m ready to tackle the one upholstery piece I have! Whew…looks as if the UN~doing is harder than the RE~doing!!! Your bit about “a partridge in a pear tree” cracked me up!!! Too, too funny!!! I think you did such a beautiful job-it is really stunning. Loooove it!! She is beautiful! Camille is gorgeous! Aren’t you glad you took her home? Such a Beauty! Love how you did the paint job she looks so sweet. Gotta get a bench for mine. I am your newest follower. Love your blog. What a great piece of furniture, you really transformed it beautifully. Love it. What a gorgeous transformation! New follower here! Love your blog! You have inspired me to get at several pieces I have to get them done. I think I am going to try your homemade chalk paint too! I am really lovin Camille! Anita, She is beautiful and I love her new paint finish! The fabric on the stool is wonderful too. Thanks for joining the Open House party. Anita, Camille is just stunning. I love the way you described her! What a good eye you have for making things beautiful!!!! I have an antique vanity that I use as a vanity and after seeing your vanity turned desk, I am thinking I should paint it. Thanks for the tip about using too much batting. I think your bench is just about the prettiest one I’ve seen! You must be having so much fun collecting for your new home!!! Wow, she’s gorgeous! I love the fabric you chose and the paint job. Fantastic!! This is gorgeous! I love the color you chose, very pretty! Pinning! Love, love this piece and the fabric choice is perfect! Love Camille’s new look ~ the color is devine! 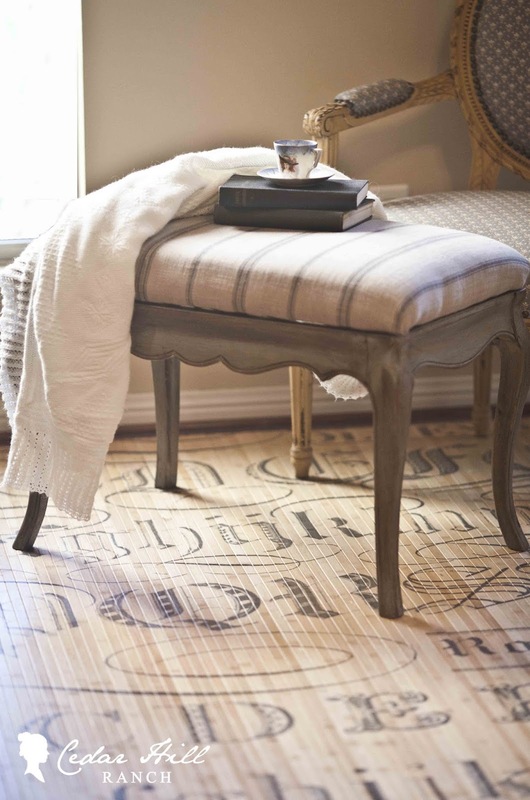 I’m also loving that printed bamboo rug… did you make that?? I visiting from Sumo’s Linky. I hope you can stop by my blog and leave a comment and Link Up! You did a fabulous job on this vanity. 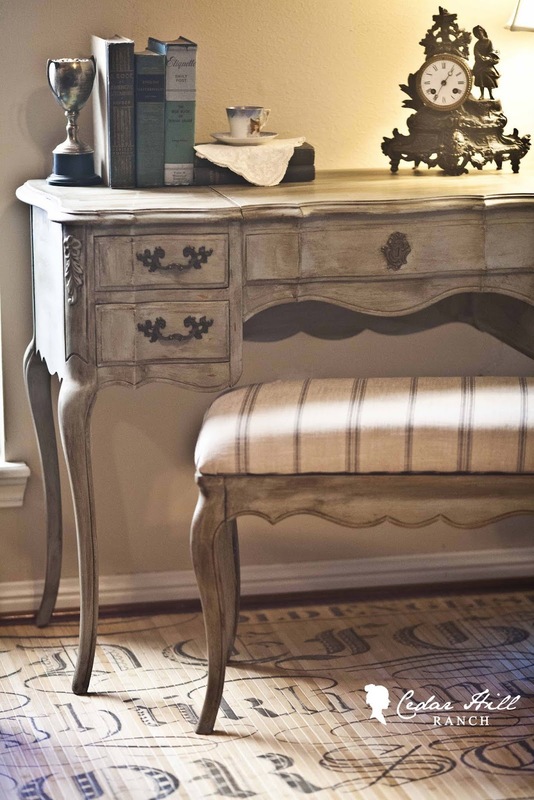 I love the color, the distressing and the fabric you used on the bench. It turned out just beautiful. I looks beautiful, Anita! I’m featuring you this week at Knick of Time Tuesday! I love this! I have been sanding away the walls in my new house – this project is about to drive me crazy and I feel like I will never finish! The color started out very similar to your vanity’s original color – but more orange in some spots. I wish I had seen this earlier, maybe I would have opted out of all the sanding! LOL – I will definitely use this paint trick in the future!!! Anita, this is the most beeeeeeeautiful piece! 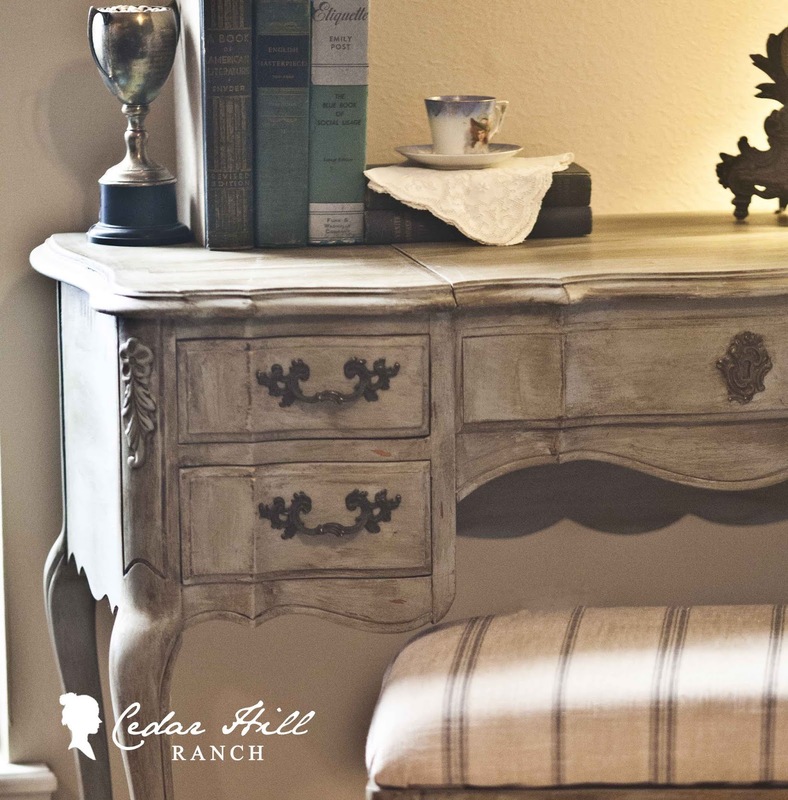 i love it, and it has to be one of my favorite pieces I have seen with the chalk paint. I do funky painted furniture most of the time, but am starting to use more and more of the chalk paint. Thank you for sharing this. LOVE IT! Love this! Do you buy flat paint to mix with the calcium carbonate and where do you get your Fiddes wax? Gorgeous!!!! Thanks for sharing. I just discovered this on pinterest – so happy to have discovered you. The whole thing is Gorgeous!!! The desk make-over, the clock, the lamp, everything! *Sigh* Maybe one day my home will have that polished look. Where did you get that neat floor mat? It is from Decor Steals. Camille is a classic beauty! And her legs! 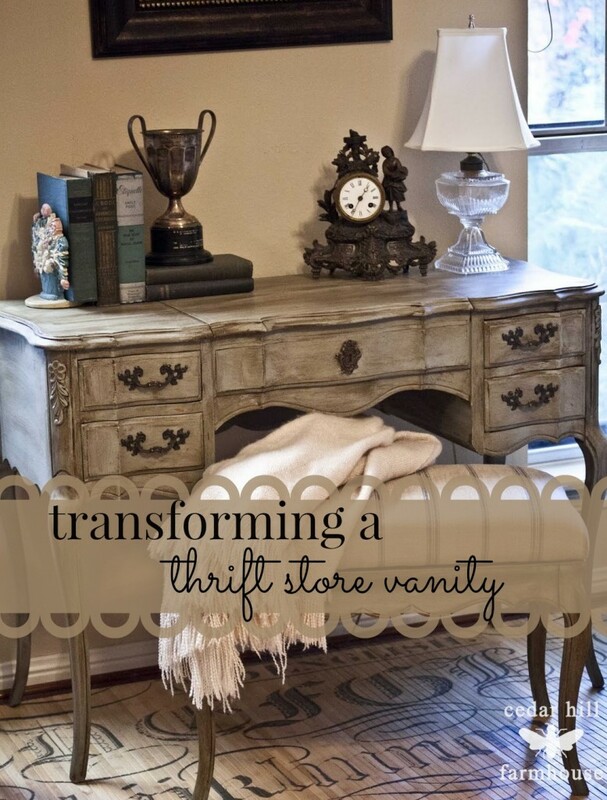 I have a vanity that needs attention and this is exactly what I am going to do! Thank you! Thank you! Merci! Camille is STUNNING! Timeless and elegant without looking gaudy or like a piece you’d be far too nervous to use! Very, very well done. I’m both impressed and envious of your talent! Thanks Katie. I use this piece every day, so it definitely gets used.